Why I Favor Small Islands — in the Caribbean and other tropical places . . . .
— well, one reason, anyway . . . . 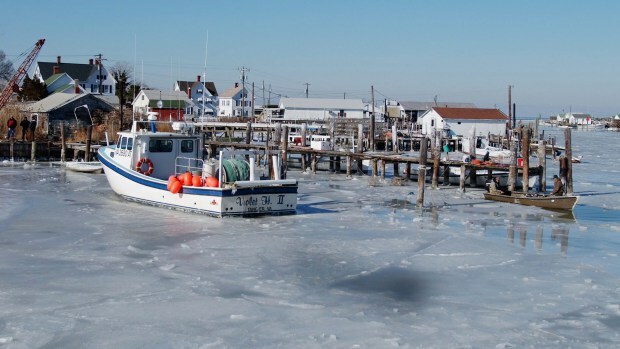 UPDATED: Feb. 20, 2015 1:34 p.m.
TANGIER ISLAND, Va. (WNEW/AP) — The Virginia National Guard flew in food, medicine and mail to ice-bound Tangier Island, and the mayor said a Coast Guard cutter was on its way Friday to open a passage to this tiny fishing and tourism outpost in the middle of Chesapeake Bay. Like many longtime islanders, Mayor James “Ooker” Eskridge played down Tangier’s plight but said medicines were essential for those who could not get off the island. Tangier has no drugstore. The guard’s 224th Aviation Regiment used a UH-60 Black Hawk helicopter Thursday to deliver milk, eggs, bread and prescription medicines to the 1.2-square-mile island of 460 people. While the island has a grocery, many islanders hop on a ferry to Crisfield, Md. — 14 miles away — for larger purchases. Ice has made that route impassable. The only way off the island now is by air; the island has a small airport. Like most of the Mid-Atlantic, Tangier has shivered through an unseasonable cold stretch, dipping to 9 degrees Friday. It received about 8 inches of snow this week. Islanders who are accustomed to the isolation said many newcomers hadn’t planned ahead for the long winter months. “We plan for it. We stock up our cabinets,” said Judith Eskridge, the mayor’s wife. “Some of the new people who come, they don’t know. The island’s frozen place in the bay has brought hardship. Some are unable to pay bills or visit relatives who are hospitalized on the mainland. Many on the island pilot or crew tugboats, often in two-week shifts. They’ve been stranded on the mainland. Because of its isolation, many Tangier residents still retain the linguistic echoes of the island’s settlers, primarily from Cornwall along England’s southwest coast. John Smith, the intrepid Jamestown settler, is believed to be the first European to step foot on the island four centuries ago. Many islanders fish or haul in the bay’s beloved blue crabs. The island is a popular destination for tourists, who explore it by foot. Most islanders get around on golf carts. Mayor Eskridge said the ice is “the worst it’s been in a long time” and has kept oystermen from Tangier Sound and a bountiful season. The season ends in two weeks. “It puts the guys out of work,” he said. “We just can’t get the boats out to them. In late January of 2003, the island was locked in ice and isolated for more than a week due to the extreme winter weather. Food stocks on the island had been dwindling, and following the deaths of several residents whose bodies were unable to be evacuated because the bay was sealed in ice, the U.S. Coast Guard intervened to break free a route to the island.